SERVES 6 In this recipe by chef Niki Ford, beauty lies in simplicity. 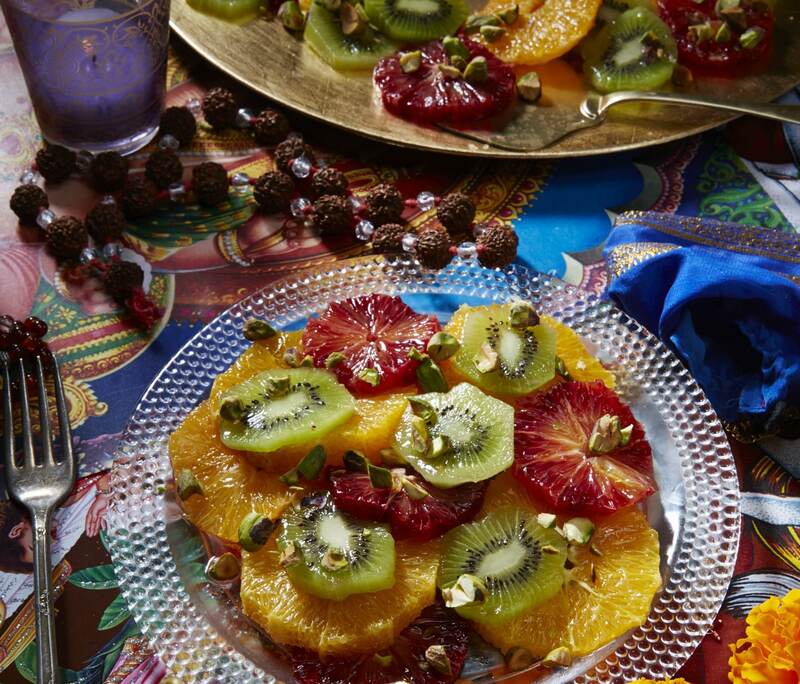 Use nothing but the brightest, juiciest oranges and add surprising dimension with rose water, mint, and pistachios, and you’ve got a fruit salad that’s equally gorgeous and delicious. With a sharp knife, peel the oranges, removing as much of the pith as possible. Slice the oranges crosswise into rounds ¼ inch thick and arrange the slices on a large platter. Peel the kiwi fruit, cut into ¼-inch-wide slices, and arrange on top of the orange slices, making sure to keep some nice patches of orange peeking through. Drizzle the fruit with the honey, then sprinkle with the rose water. Scatter the pistachios and mint over the fruit and serve. Want more of Chef Niki Ford’s lavish and flavorful recipes? Get the GFF Magazine‘s Winter 2015 print or digital issue here!